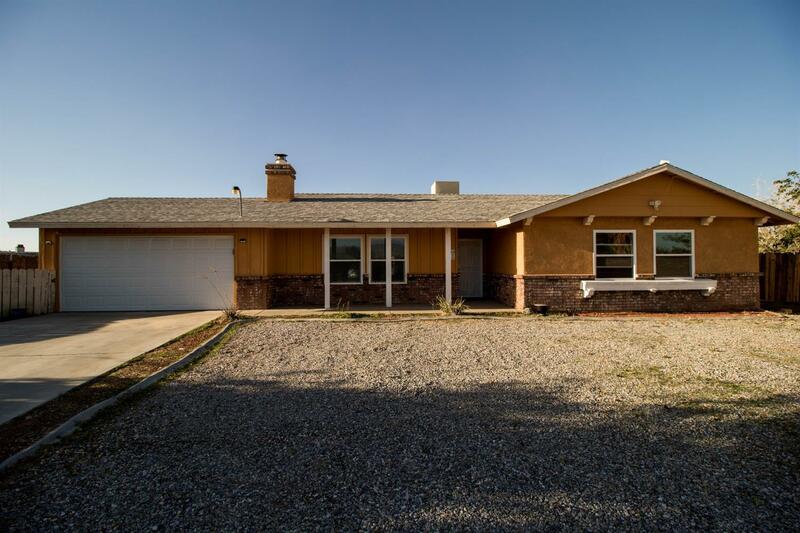 Charming Single Story Home with a Pool in a Secluded cul-de-sac in the Town of Apple Valley! Appealing curb appeal as you arrive and a long drive way and RV access for plenty of parking. This home boasts 3 bedrooms, 2 bathrooms, 1, 762 sq.ft. just under Half an Acre and attached 2 car garage. As you enter the living room is flooded with natural light and has a cozy brick fireplace perfect for desert nights. Step into the upgraded kitchen with beautiful cabinets, backsplash, granite counter tops and laminated wood flooring. The master bathroom has upgraded granite counter tops and cabinets, his and hers closet space and a rear door to access patio area. The guest bedrooms and upgraded bathroom granite counter tops and cabinets are perfect for family and guests. Owner recently replaced Windows, Septic Tank and A/C Unit. This is a Wonderful Opportunity to own a home with lots of upgrades, View Today!